The emphasis of our research activities lies in the area of computational seismology, i. e. the development of numerical methods for computing seismic wave propagation and rupture processes. Furthermore, tomographic methods based on these achievements allow us to account for the three-dimensional character of earth models and wave fields. These methods comprise e. g. the finite difference method, pseudospectrals, finite (spectral) elements and finite volumes. Adopting these methods leads to computationally complex programmes which (at the moment) only allow for high performance computers to calculate realistic models. This means that – in addition to standard programme development – a parallelization of our algorithms is necessary which is implemented by using the so-called message passing standard (MPI). 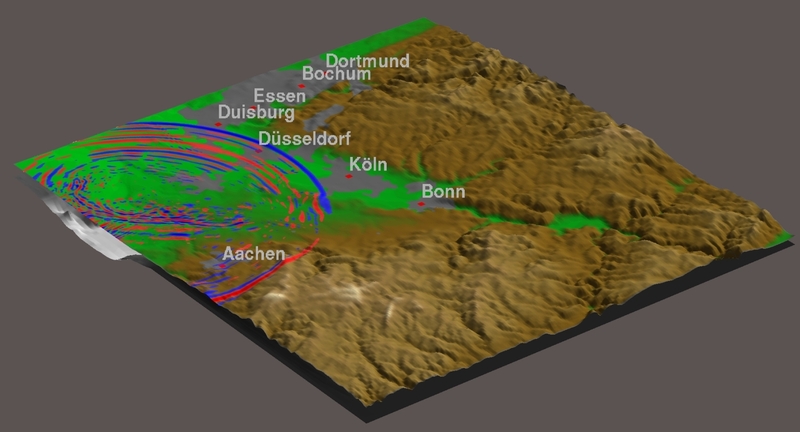 Computation of earthquake scenarios in seismically active regions. We aim at producing reliable calculations for ground movement in possible earthquake scenarios. A pre-requisite for doing so is information about the crustal structure. Such calculations are being performed for the Cologne and Beijing Basins and Southern California. 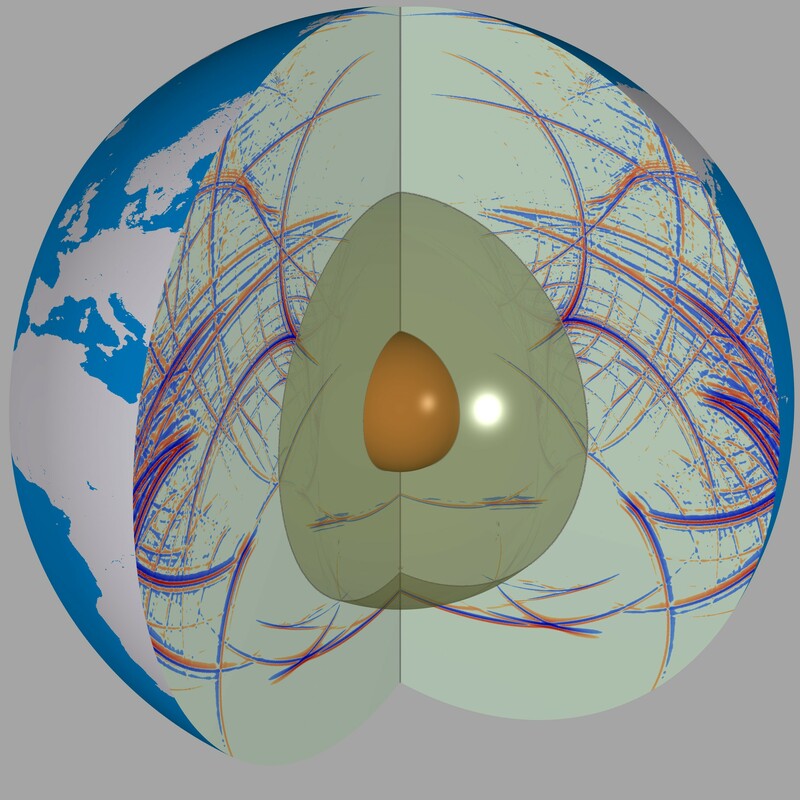 In global wave fields have to be simulated for spherical geometries. By now it has been made possible to divide the whole planet into volume sections and to simulate wave propagation after major earthquakes. In the coming years this will direct us toward a better tomographic picture of the Earth's interior which will lead to a better understanding of dynamic processes located there. Simulation technology also plays a major part in apprehending rupture processes which have not yet been fully understood. The reason for this is that observations near zones in which earthquakes arise (about 10 km deep for crustal quakes) are almost impossible. Nevertheless, rupture mechanisms can be simulated and compared to the data recorded on the Earth's surface. In volcano seismology, the simulation technology will allow for modelling the complex nature of seismic sources, the topography and the structure. Consequently, we will receive a better understanding of the interior of volcanoes. Another focus of the seismology group is observing and modelling rotational motions which are induced by earthquakes. These observations have lately been made possible by employing ringlaser technology and have provided seismology with a new observable. For mroe information see the Science movie and article here. Our current research projects are enhanced by the Seismological Observatory in Fürstenfeldbruck which is part of the worldwide seismological network (GSN). We use a modern seismic network in Bavaria which enables us to measure the seismic activity on our national territory and the neighbouring regions in real time and in the case of perceivable earthquakes inform the population and authorities. This network also records earthquakes worldwide whose data is entered into international data centres.